A young man seeking treasure and renown must prove his worth, standing firm in the shield-wall and guarding his war-companions. And even varl may think twice before assaulting a group of Raiders, since their interlocked shields can blunt the most savage of blows. 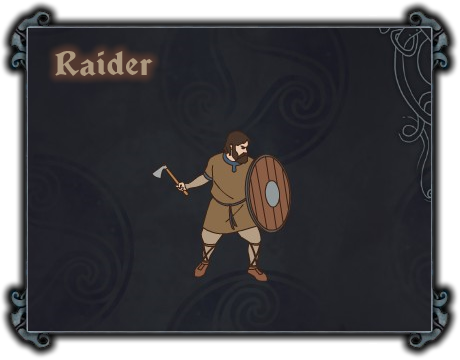 Shield Wall (passive) (edit): When a Raider is adjacent to one or more allies, he both gives and receives a +1 Armor bonus. This bonus increases with each adjacent unit, and can be received from other Raiders at the same time. Whenever Shield Wall protects a unit, the damage number on Armor is colored in red to warn attackers. Similarly, the Strength damage number will be red when the potential damage is reduced by Shield Wall (but not when the probability of doing 1 damage is reduced). A unit's Armor cannot be reduced below the total Shield Wall bonus. Example 1. With three Raiders in a straight line, the central one gets +4 Armor (from two adjacencies) and the others each get +2. Example 2. A unit with its Armor reduced to zero enters a Shield Wall between two ally raiders, thus receiving a +2 Armor bonus (or +4 if its a Raider). All further Armor-Break attacks on this unit are meaningless yielding zero Armor damage. Illustration: Three Raiders forming a Shield Wall that effectively increases their Armor. (1) The Backbiter and Raidmaster — 10 Armor each — do not have any adjacent allies while the Thrasher — 11 base Armor — is adjacent to one ally unit, a Bowmaster, thus granting and receiving a +1 Armor bonus. (2) The Thrasher moves between the two ally Raiders, so each one gains a +2 Armor bonus from each adjacency. The Raidmaster and Backbiter get a +2 bonus each while the Thrasher, sharing two adjacencies with ally Raiders, gets a +4 bonus. The Bowmaster loses the +1 Armor bonus.